For a change, figure sales/release timing isn't as bewildering as the changes in Haruhi Suzumiya's hair style. Pre-orders have launched for 1/4th scale The Disappearance of Nagato Yuki-chan figure of the spin-off's take on Yuki Nagato, dressed in a Santa bunny girl outfit. And, with Good Smile Company distributing, it's actually scheduled to ship in December! 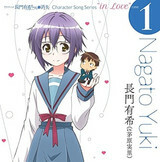 Puyo's The Disappearance of Yuki Nagato-chan manga wrapped up, with the 10th and final volume planned for next February. So, maybe the author of that spin-off and The Melancholy of Suzumiya Haruhi-chan cutesy comedy has some more time on his hand, because he's been Tweeting more about games and anime lately. 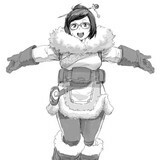 Like with other manga artists, they've become quite taken with Overwatch and decided to share their take on its characters. 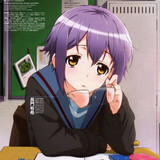 It has been officially confirmed that a monthly serialization of Puyo's Nagato Yuki-chan no Shoshitsu/The Disappearance of Nagato Yuki-chan manga finally ended in the newest September 2016 issue of Kadokawa's Young Ace. 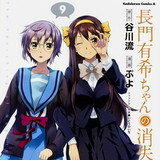 The spin-off manga of Nagaru Tanigawa's Haruhi Suzumiya light novel series had been serialized since 2009. Hit the jump for more details. 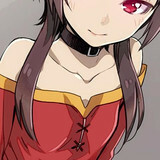 It's probably not terribly surprising that chuunibyou arch-mage Megumin the KonoSuba anime has been one of this season's hit characters. Among her many admirers are some industry pros. Check out their tributes after the jump. 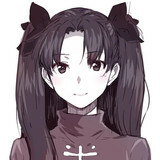 The Disappearance of Nagato Yuki-chan manga artist Puyo has been sketching up storm and with the adaptations of his series Fate/stay night [Unlimited Blade Works] ending, he's posted a sketch of the latter's Rin. Get a look after the jump. Inkling mania isn't just running wild among anime fans. 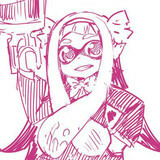 Manga authors are also starting to play Splatoon, so don't be TOO surprised if your favorite series takes a week off. The Disappearance of Nagato Yuki-chan's Puyo and My Hero Academia's Kōhei Horikoshi are among the notables sharing their enthusiasm. Get a look after the jump. FUNimation has confirmed what fans had noticed a bit early. Their placeholder (joke) cast listing for the "Broadcast Dub" of spring 2015's The Disappearance of Nagato Yuki-chan anime has been replaced with the names of the original The Melancholy of Haruhi Suzumiya team thanks to an English dub from Okratron 5000. More after the jump. 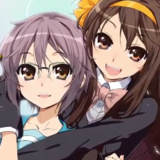 At last summer's Otakon, FUNimation announced that they'd picked up the license to The Melancholy of Haruhi Suzumiya as well as gag spin-off Melancholy of Haruhi-chan Suzumiya. This season, they're simulcasting the new spin-off The Disappearance of Nagato Yuki-chan. Well, now it looks like Haruhi herself (or some proxy) is placing personal ads from FUNi's neighborhood on Craigslist. More after the jump. 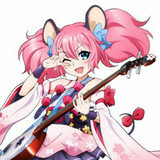 Lantis has posted a 100-second short music video for "Arigato, Daisuki," the ED song for the ongoing TV anime Nagato Yuki-chan no Shoshitsu/The Disappearance of Nagato Yuki-chan, performed by Minori Chihara, the voice actress of Yuki Nagato in the show. Check the clip after the jump. 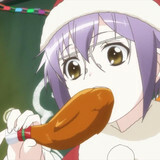 FUNimation has kicked off their spring plans with news that they've licensed the Satelight-produced TV anime adaptation of Puyo's Nagato Yuki-chan no Shoshitsu/The Disappearance of Nagato Yuki-chan manga and Bones' anime based on Sanrio's character project Show By Rock!! More after the jump. 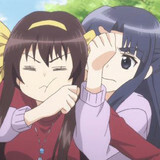 Kadokawa's official online store has started accepting pre-orders for the limited edition of the upcoming 9th volume of Puyo's The Disappearance of Nagato Yuki-chan manga to be published on October 26. The edition will come with a Blu-ray of a newly-produced anime episode. Hit the jump for more details.